I open tonight’s blog with a quote from my A. P. Art History textbook, Gardner’s Art Through the Ages: A Global History, 13th ed. In the ancient and medieval worlds, artists rarely wrote commentaries on the works they produced. Beginning with the Renaissance, however, the increased celebrity artists enjoyed and the ready availability of paper encouraged artists to record their intentions in letters to friends and patrons. What an amazing age we live in today, with the blog empowering us now to publish our ideas globally, at no cost! I have never felt really “at home” talking about my own art, though I’ve loved discussing art history throughout the years. Reading this text tonight (while preparing yet another A.P. class) inspired me to make a more concerted effort with future blogs to discuss my theories and practices of watercolor more thoroughly. Presently, I’m not sure what direction future blogs will take, and I really don’t know if “lookers” at my blog are actually reading what I have to write, or just looking at the pictures (Either way, I’m very happy to get the number of daily hits I’ve been enjoying!). 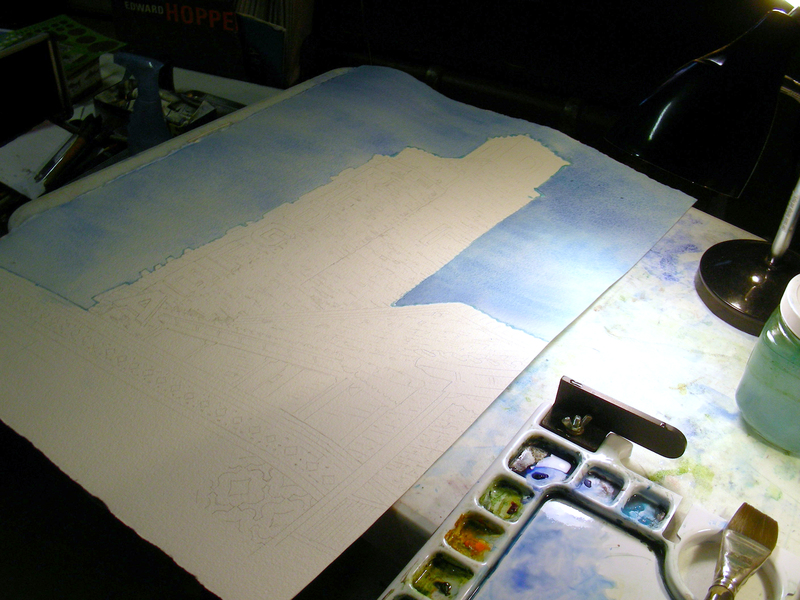 Nevertheless, I pledge to do a more thorough job talking about art as I continue to post my watercolor projects. Hopefully, I’m turning a new page here in the blog odyssey. I’ll give it my best. Texas temperatures soared above the 70’s today, and the landscape of my neighborhood is bathed in yellow light as the afternoon fades. One-third of me wants to go out with the watercolor block and find a plein air setting to sketch. But there is this other third that has missed this large watercolor languishing for two days in my garage. And then, the final third misses reading and decompressing. The week in school has sucked most of the intellectual juices out of me. So . . . 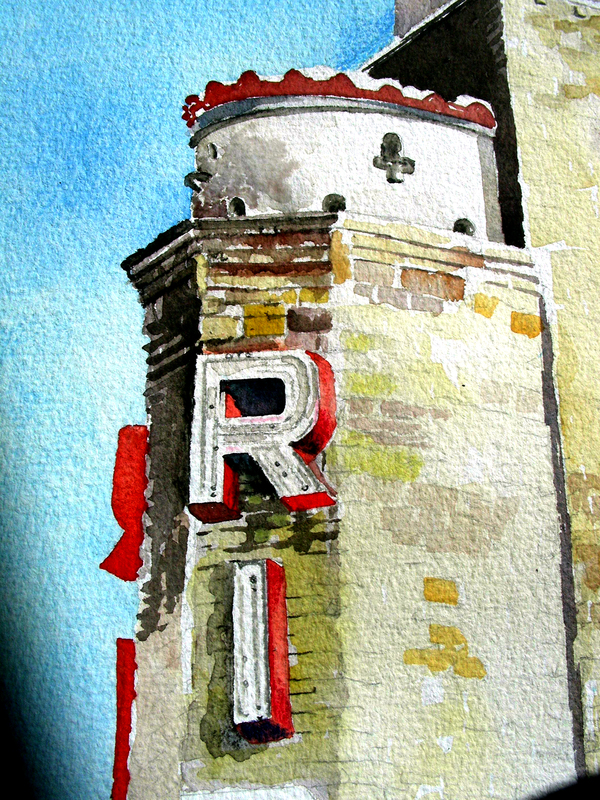 I just took another large bite out of this 30 x 22″ watercolor, getting lost in the large letters hanging on the tower, as well as all the wonderful rusticated cut stone of this magnificent structure. I had to stop when the entire tower flooded with washes of warm layers of rose and gold. Now, the entire painting is very wet, and will remain so for quite awhile. When working on 300-lb. paper, I notice that the pools of wash tend to linger forever. I have pulled out some reading on Kant and the eighteenth-century Enlightenment. I have been immersed in this topic for a couple of weeks now, and even when I’m not reading, I’m composting all the ideas that have been stored up from the texts, and as the days go by, more thoughts begin to fertilize and grow. Right now, I’m enjoying in the most profound sense the sounds of the mocking birds all over my watered lawn, the jazz playing on my stereo, and the whispered approvals of Kant and Company as I continue to try and understand what these great thinkers were all about in their day, and what they can offer to mine. As for this painting, I have not been able to reach any satisfaction with the tonal colors of the tower, on either the shadow side or the lighted one. Right now, I am liking more the color on the sunny side. I mixed some cadmium yellow deep with a little cadmium red medium, along with whatever was still in my brush (some sepia, alizarin crimson, and ultramarine blue). The large washes of warm color are looking good (while the painting is wet–we’ll see what happens when it dries out). The shadow sides are still eluding me. I have tried mixtures of ultramarine blue, alizarin crimson, cadmium yellow deep, and a little sepia, and am still unsatisfied with the colors emerging. I’m glad watercolor is transparent. I’ll just have to keep glazing and see what finally comes to the surface. I’m not frustrated, just intrigued as I try to match the colors of the cut stone that makes up this tower. I’m also finding the neon tubing in the letters a challenge. Once I feel that I have what I want, I’ll strengthen the colors and contrasts and let them stand out a little better. Right now, I’m keeping them subtle, because I still haven’t really “solved” them. I thought this painting was going to be easy. Serves me right, I guess. Perhaps I’ll get more done on it tonight. As I write this, the sun has disappeared behind the ridge and I now have to resort to artificial lamp light and fluorescent overheads in my garage–not my favorite way to work, but still, it beats waiting for the next day to roll up. A large black cat with a red collar has just dropped by to say Hello. He does this at some point every evening that I spend working in the garage. I have no idea who owns him, but I know his visit is always good for about five minutes–long enough to examine and sniff everything around the perimeter of my garage–and then he moves on without a word, I guess to his next stop. But he always comes to me to rise on his hind legs like a kangaroo and let me scratch the back of his neck, a friendly soul. It’s good to be painting again. Thanks for reading. 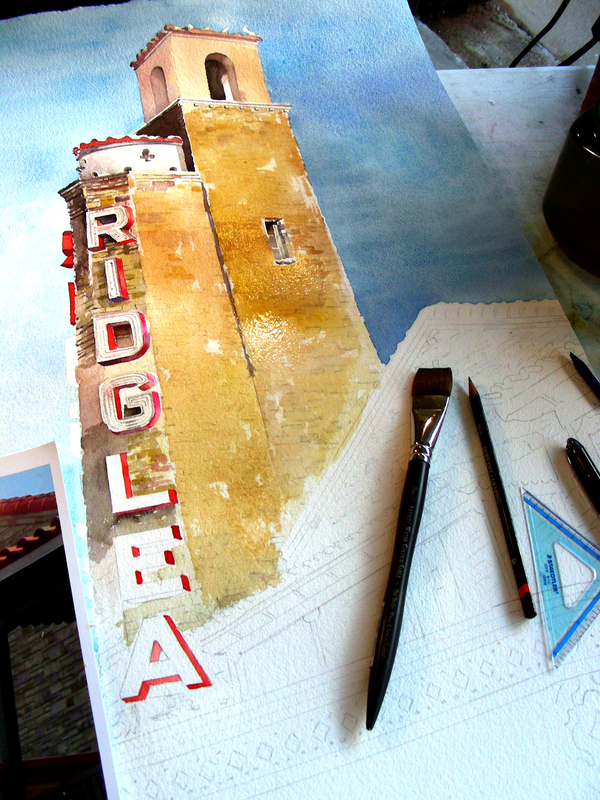 I have hit a snag, trying to find time from my school schedule to resume my Ridglea Theater watercolor. 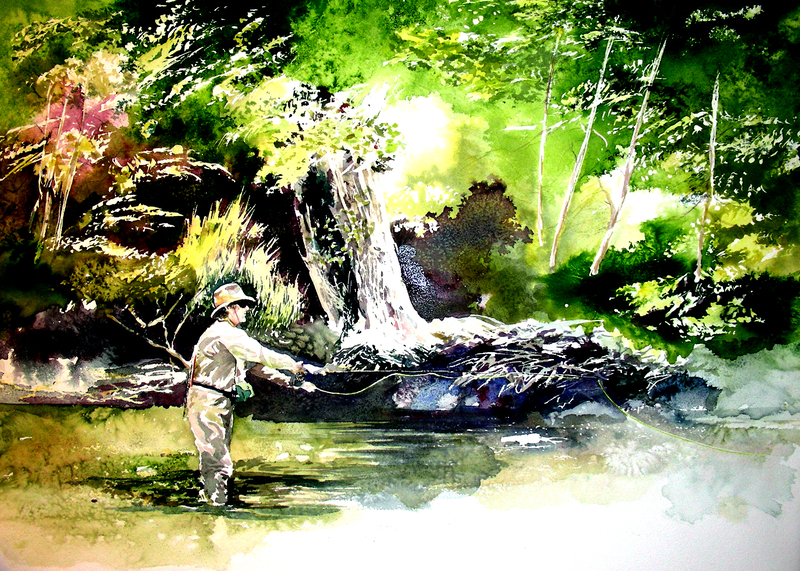 Meanwhile, I’m posting my first fly fishing watercolor, created about five years ago. The setting is Troublesome Creek, northwest of Denver, between the towns of Parshall and Kremmling. I was guided by Bull Basin Outfitters, and thanks to my guide Bob House, had a fantastic day. This was taken from a photo of my landing a 24-inch Cutthroat. I did not even know my guide took the picture, using my camera, until two weeks later when I got home and began uploading photos from my digital. I loved the composition, so I chose to render it in watercolor. My favorite part of the painting is the stand of trees on the left border. I was working hard on the drybrush, trying to replicate an Andrew Wyeth effect. 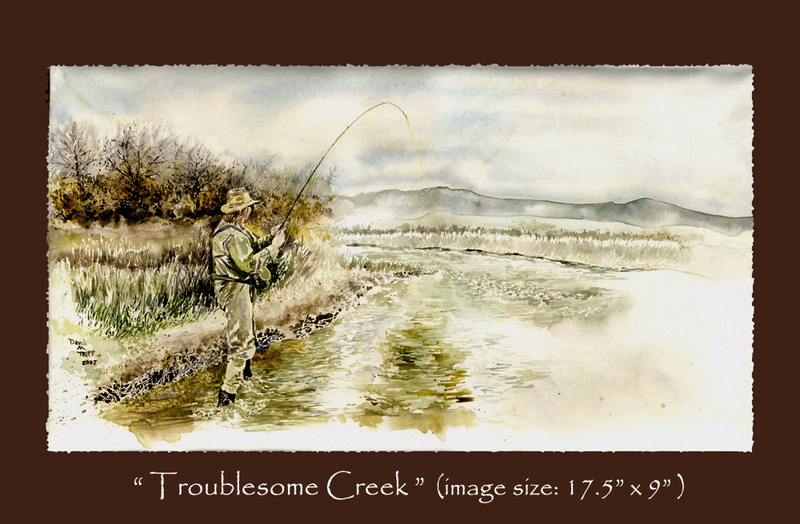 I have been hindered from working further on the Ridglea Theater watercolor, and did not want my blog to languish for more than a couple of days, so I am re-posting this watercolor of me fly fishing the South Fork of the Rio Grande in southwestern Colorado. This is my second “poured” watercolor, and I still take delight in looking at it. 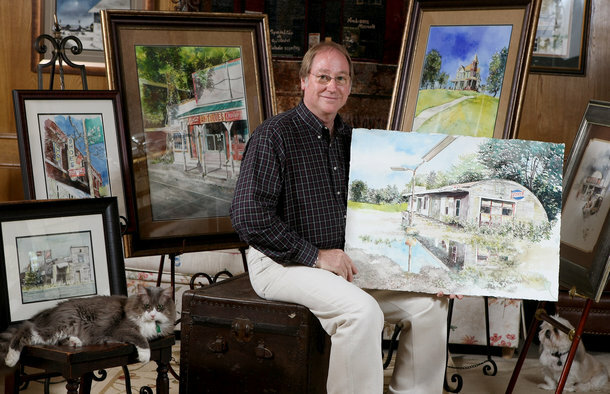 The original painting is still for sale at the Weiler House Fine Art Gallery (http://weilerhousefineart.com), and I still drop by occasionally to study it. The background trees and water patterns were mostly poured, with a little brush and pencil work and salt added after the colors were set. Last night, I had a delightful phone conversation with a dear friend and former student currently residing in Colorado. After I hung up, I realized that it has been over two years since I visited that lovely state and entered one of those mountain streams. As a matter of fact, I haven’t taken out my fly rod in several months, and I’m really getting the itch again. When Norman Maclean’s novella A River Runs Through It was released as a motion picture in 1992, I was just finishing a Summer Seminar at Oregon State University, sponsored by the National Endowment for the Humanities. I knew then that fly fishing was something I had to take up, and though it took about another eight years for me to get into it, I have not been able to lay it down. I cannot describe how my breathing changes when I step into a crystal clear Colorado stream, and peer into those pools, scanning for rainbows and browns. I take such exquisite delight in watching the seams dividing slow current from fast, and current from pool, and watching the trout line up outside the fast water to watch insects drift by. My heart jumps into my throat, every time I see the flash of a trout rising to take my fly as it bobs and flows past in the current. I miss Colorado desperately, right now. Eventually all things merge into one, and a river runs through it. The river was cut by the world’s gerat flood and runs over rocks from the basement of time. On some of those rocks are the words, and some of the words are theirs. Looks like I’ll have to leave this one for awhile. 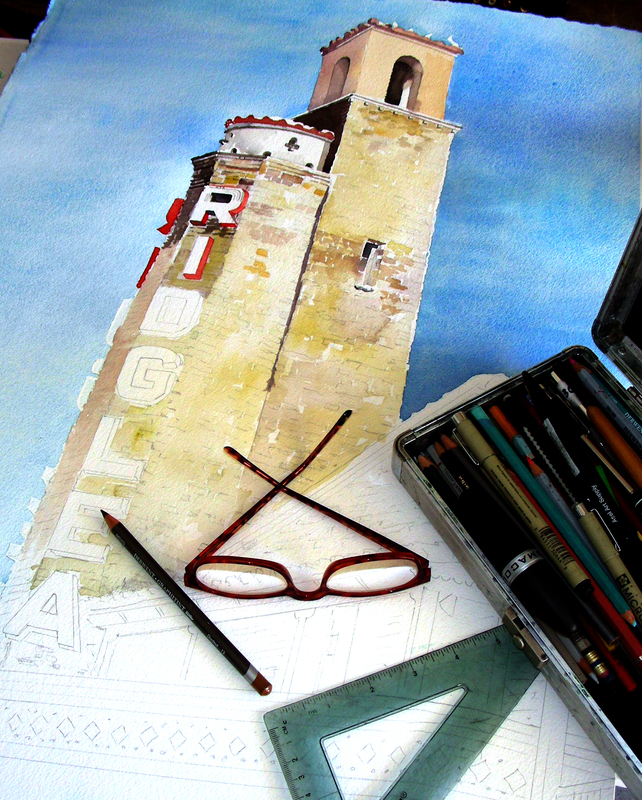 I just put in a delightful early afternoon, working on only six vertical inches of this 30-inch vertical watercolor. Not much quantitative work accomplished, but hopefully qualitative. Watercolor is not my job, and some days I wish to God it were. Now I have to make preparations for my real job which will begin early tomorrow, and I’ve procastinated that task for as long as I can. If I can make inroads sooner than anticipated, then I will certainly return to this composition tonight, with utter delight, and would certainly post another blog before bedtime. But I have my doubts that that will happen. So, if I don’t return tonight, I will certainly send out a few lines on the morrow. Thank you always for reading. Temperatures have dropped outside to winter levels. I spent the afternoon drawing out this Ridglea Theater, located on Fort Worth’s west side. The evening was then given to adjusting 8 x 10 photos so I could see the details well enough to support this 30 x 22″ watercolor. Moving out to the garage, I next chose to mask the perimeter of the building, and then allowed about an hour for the fluid to dry. Finally, around midnight, I began blocking in the sky. By 1:00 a.m. I could remove the masking and survey what I had done so far. Sleepy now, I’ve decided to call it a day. The alarm is set for 6:00 a.m. Hopefully, I can get some quality work in during the morning hours before my band comes over to practice for an upcoming gig. It just occurred to me this morning, while driving to school in the pre-dawn, that Spring Break is two weeks away. It couldn’t be more timely, for me. That is a week on the school calendar that always whispers “road trip” in my ear. Fantasies of plein air painting, fly fishing, reading stacks of books, journaling and blogging flood my soul (as well as sleeping in!). 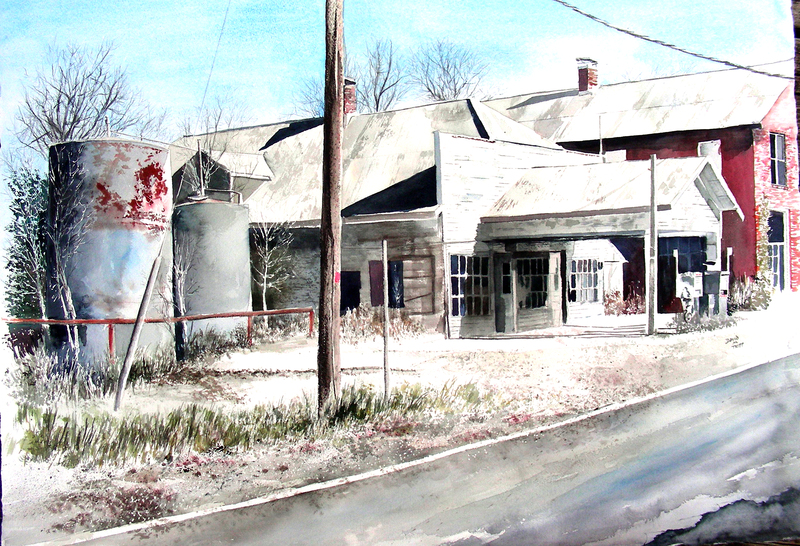 Since I just posted a completed painting of a defunct gas station, I thought it apropos to post this Spring Break painting from 2006. I had gone with friends to fly fish the White River in northern Arkansas, then traveled to visit a retired principal/friend in Bentonville, and then, in a surprise twist, journeyed into Oklahoma to re-visit a town where a member of my traveling party had grown up as a child. She said she “wanted to do the Proust thing,” an idea that had to be explained to me, and now remains with me forever. French novelist Marcel Proust spoke of how certain moments stir our senses to recall primal memories from our early childhood that are profoundly warm and worth recalling. Yet, any attempt to seize those moments will lead immediately to their dissolution. They are gifts, and they only remain a moment, often surprising us with what the painter Robert Motherwell called the “shock of recognition” and then vanishing. But the warmth remains. I had known this experience throughout my life, and always cherished such gifts, but not until my friend introduced me to Proust did I have a way of describing it. Incidentally, my friend on that day re-visited her childhood town, and in the end concluded that “Nothing happened.” Sometimes it is that way. We cannot make it happen. We don’t always know Wordsworth’s “Tintern Abbey” sentiments. 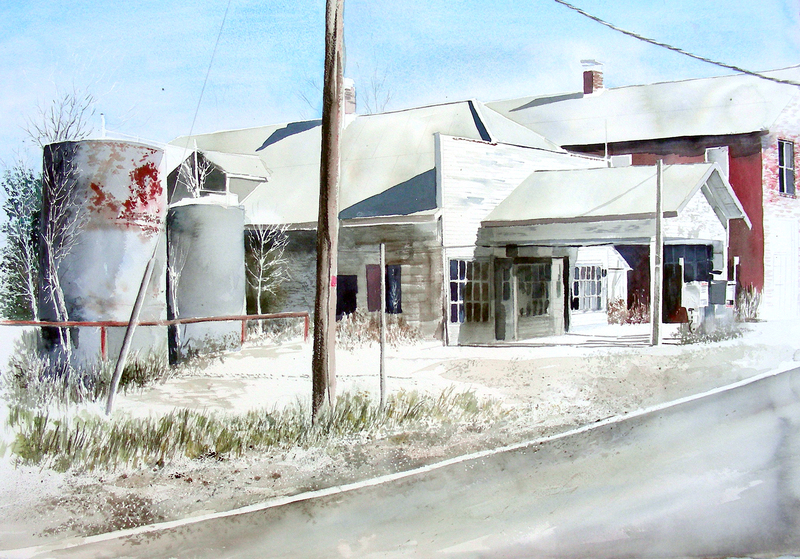 This painting is virtually all that is left of Binger, Oklahoma–two buildings at a crossroads. When we travelled Oklahoma, we were seized by the sight of these buildings and thought they possessed a certain “Edward Hopper” isolation. So we took a number of photos and I later worked this into a composition. 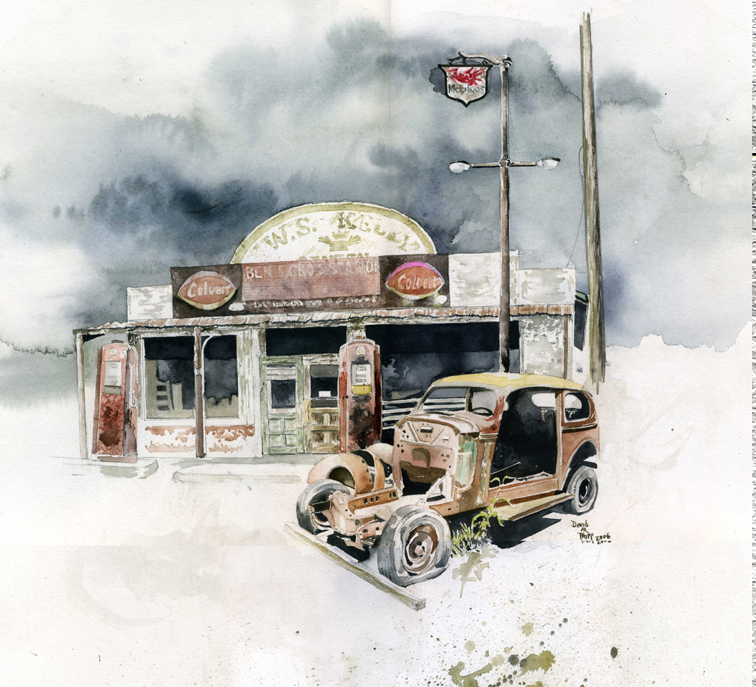 In fact, I have included this gas station in three of my paintings (the other two can be found on my website: http://recollections54.com). The 1924 Oldsmobile (what is left of it) is parked behind a restored auto showroom in Hillsboro, Texas, on E. Elm Street. I thought this abandoned filling station needed an abandoned car for a companion. Overall, I was happy with the composition, though no one has yet purchased the original watercolor. I have managed to sell a good number of limited edition giclee prints of it, however, and dozens of greeting cards. This is the time of year that I am bitten by the Jack Kerouac On the Road sentiment. Fantasies of Oklahoma, Colorado, Missouri and Arkansas flood my being, and I begin looking at the calendar, contemplating the nine days and wondering if I can pull one off this year. I always look to that time as one of restoration, decompression and retooling (and recovering some sleep!). Whatever happens, my priority is to create at least one decent watercolor, hopefully en plein air. Despite another night’s restless sleep, I somehow found the energy and enthusiasm today to push out the remainder of this watercolor and declare it a fait accompli. As stated in prior posts, the abandoned service station is located at Robertsville, Missouri, west of St. Louis near historic route 66, six miles southwest of Pacific. I created an earlier version titled “Cold Desolation” which is a frontal view of the station. Though my body is ragged from lack of sleep, I feel compelled to write about this satisfying day in the classroom. My topic in regular Art History covered the Neo-Classical, Romantic and Realist periods of European and American painting. As I lectured through these areas, I found my personal life and my art connecting more intimately with these periods than ever before. The Neo-Classical era of painting, corresponding with the 18th-century Age of Enlightenment, focused on discipline, precision, draughtsmanship and composition. It was an era of painting beset by rules and clarity of presentation. Speaking of my own artistic endeavors, I have always been more of a draughtsman than a painter. My painting professor from Vienna always told me that I created “colored drawings.” I suppose that has something to do with my settling on watercolor as a means of expression, since I pursue it as an extension of drawing, and while creating a composition such as the one just posted, I feel that I am drawing 90% of it, and making an effort to paint the rest. Moreover, as I worked at this piece, I was constantly stepping back to view it from a distance and make decisions concerning contrast, area of focus, warm vs. cool colors, and high vs. low intensity. Compositional questions dogged me throughout this work. So yes, I feel a Neo-Classical strain as I work at my art. Realism followed on the heels of the Neo-Classical and Romantic movements. G. W. F. Hegel has left us with a philosophy of history that focuses on dual movements (thesis and antithesis) that become locked in dispute, and when a resolution arises that somehow finds a consensus between them, we call it a synthesis. That is what the Realist school of painting seemed to do. The artists could acknowledge that life contains rules and structure on the one hand, and the opposite extreme of romance and risk on the other, but life for the most part is Aristotle’s Golden Mean between the extremes. Life involves going to work everyday, paying bills, eating, sleeping, and navigating through the extremes of success and failure. The school of Realism wants to show slices of everyday life as they really are. They thought history was for the past and romance was for dreamers. Another watercolor in the hopper. A very satisfying day in the classroom as well as in the studio. And a chance to think through some large issues that inspired the genius of Enlightenment thinkers and artists. Thank you for reading and taking time to share this one with me. I admit surprise at how fast this large watercolor is coming together. I’m used to longer stretches of time for “composting” as I think through what I want to do exactly. But time to paint is really scarce these days, and when I approach this particular watercolor, I seem to be painting faster. Today I added the dark trees on the left border and worked on the power line as well as the guidewire attached to the post at the left. I’m still tinkering with the drybrush weeds along the left as well. I’m not sure what to do next, so I thought I would go ahead and put this on the blog to let anyone who reads this know that I am still chipping away at this piece, and think I may be finished with it in the next day or so. I still want to deepen the shadows and heighten the contrast, hopefully to give the composition a nice “Edward Hopper” kind of pop. I always gravitate to his watercolors because of their delightful use of contrast.